Industrial Mist Fan-CH-560S-F & CH-560S-S-CHOSEN VENT TECH LTD. The mist fan can produce mist in diameter 10 to 20 microns. Mist can float into the air, rapid absorb and evaporate the quantity of heat, which can cool down 4 to 8 degrees, to reach the cooling effect. It is used for cooling and humidity suitable in outdoor playground, scenic area, flower garden greenhouses, industrial workshop, open-air eatery, farmers market, farm and other outdoor occasion in high-temperature and drying. · Ideal mist fan for the wide-range environment which needs humidity , cooling, disinfection, dust removing. Extremely atomization efficency. · Centrifugal misting system, no trouble of nozzle clogging, low noise. 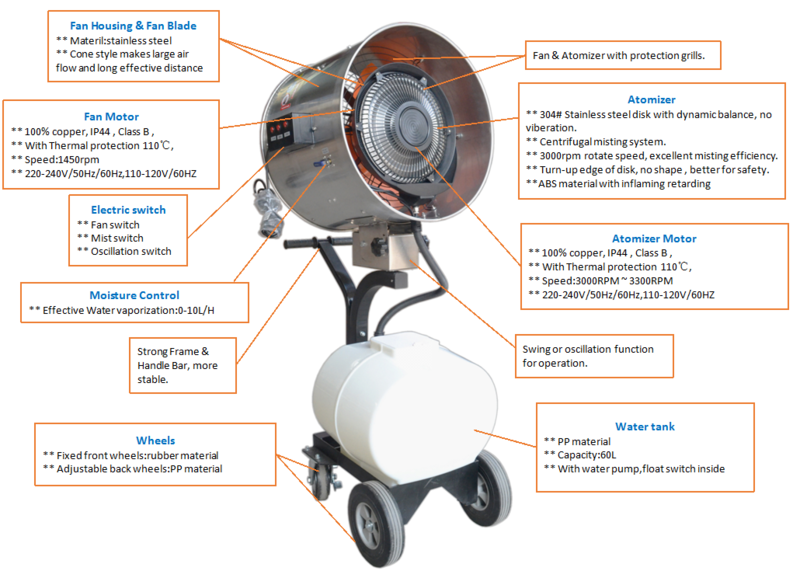 · Heavy duty axial fan with 8000CMH air flow, the misting can be reach over 15meters distance. · Stainless steel fan housing & fan blades, ANTI-Corrosion, Long lasting. · Industrial: Factory, Workshop, Warehouse. · Agricultrual: Greenhouse, Poultry House, Flower House, Cow Shed, Pig House.